By 1931 Beech resurrected a cabin biplane design started by engineer Ted Wells at Travel Air but rejected by that company’s Curtiss-Wright owners. Aimed at the business executive end of the private owner market — a bold move at the height of the Depression — was the Beech Model 17, continuing the by now-defunct Travel Air series numbers which had ended at CW-16. Apart from its compact dimensions, the four-to-five-seat radial-engine biplane had the unusual layout of its top wing set behind the bottom. This negative or backward stagger arrangement offered several advantages over the more common forward stagger, providing an elegant solution to such problems as pilot visibility and undercarriage location, as well as providing good stall and recovery characteristics. On paper, the 17 promised to be an airplane of out-standing performance for any category, let alone a four-place commercial biplane. A top speed of 200 mph and landing speed of 60 was what they were looking for. The powerplant would be a 420-hp Wright R-975-E2 radial with a Smith controllable prop. While the narrow landing gear was basically fixed, it has enormous streamlined fairings that allowed room for the wheels themselves to retract 0.15m (6in) in flight. The basic structure was welded steel tube, largely fabric-covered; the braced tail unit was conventional; but with a non-swivelling tail-wheel. Rather than having a neutral stagger - the upper wing stacked directly above the lower wing - or a positive stagger, with the upper wing leading, as it did on most biplanes, the 17 had a negative stagger: the lower wing was farther forward than the upper one. 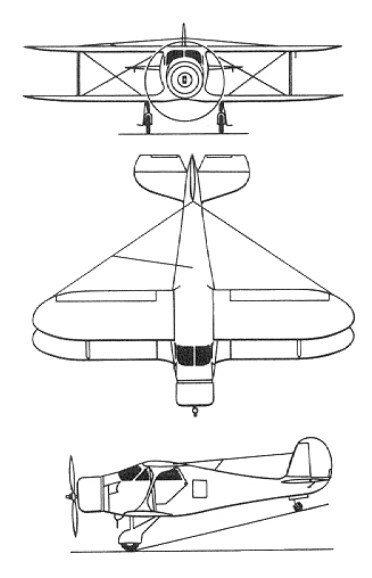 The unique wing configuration had three immediate advantages. Visibility had always been a problem with biplanes and high-wing monoplanes, but with the upper leading edge so far back, the pilot had an excellent view. There was an aerodynamic benefit, too: the center of lift of the upper wing was behind the center of gravity, and that of the lower wing was in front of the CG. The lower wing let go first in an approach to a stall, and since the upper wing was still flying, the rearward center of lift would automatically bob the nose down, the plane would pick up speed, and the lower wing would be flying again. At the time, this docile stall was an unusual feature for an airplane of such high performance. A third benefit of the lower wing's forward position was that it allowed the gear to be wing-mounted rather than attached to the fuselage with drag-producing struts and brac-es. This foresight led to the complete retrac-tion of the gear into the wing and belly, beginning with the B17 model in 1934. 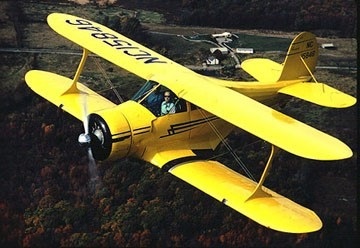 The nickname Staggerwing was soon coined and shows no signs of going away after almost 65 years. The airframe broke no new structural grounds, having wooden wings and steel tube load-bearing fuselage with wooden formers to carry the aerodynamic shape, all but the forward fuselage covered in fabric. Cessna let his old partner use part of the Cessna plant, temporarily closed by the Depression, to begin building Beechcrafts. Careful attention to streamlining achieved Walter Beech’s specifications of 200 mph top speed while landing at 60 mph, a speed range unknown in 1932, on the 420 hp of a Wright R-975 Whirlwind. On 4 November 1932, six months after the factory opened, test pilot W H "Pete" Hill flew the number‑one Model 17R, NC499N, at a top speed clocked at 201.2 mph. 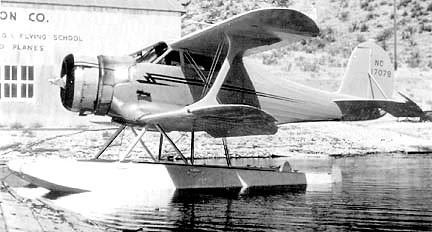 NC499N was destroyed in a crash on 10 December 1936. In its first two years, the Beech Aircraft Company sold just one airplane, NC58Y. The customer was a Tulsa oil‑drilling out­fit, whose pilot perhaps gave a clue as to why sales were so slow. For his first hundred hours in the airplane, he reported laconically, he had very little idea where it was going during takeoff or landing. It was returned to Beech Co as a trade in mid-1935 and reportedly dismantled. The airplane would have to be improved. As a first step‑just to see what would happen, he advertised the plane, which already had 420 hp, as available also with the 700‑hp Wright Cyclone engine. What happened was an order for one such model from a worsted mill in Maine. 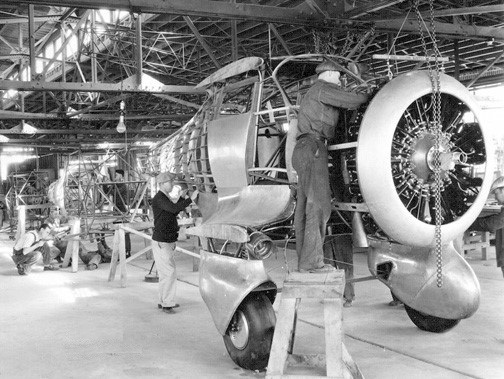 Beech built the airplane, but just running up the engine shook the airframe so badly that it continually broke weld joints. In the air it was smoother, and could hit 250 mph, which was faster than any fighter of the time. The pilot who flew it for the customer was given one hundred days to live by his friends, but he confounded them by flying it safe­ly for a year. Thereafter it was sold to Howard Hughes, in whose service it was cracked up on takeoff in the 1937 Bendix Race. The preproduction model, the A17F with fixed undercarriage, was fitted with a 690-hp Wright Cyclone, but although the basic design would appear to give stable flight characteristics, the horsepower was excessive, resulting in “porpoising” due to the short fuselage. There were four fixed-gear 17s built - the two 17Rs, an A17F and an A17FS. All stood on tall, stiff, narrow gear and had short-coupled fuselages. It was a beautiful airplane in the air but it was very touchy taking off and landing If you were just a second off your timing on the use of the rudder, you were in trouble. The word on the plane's high speed spread quickly, and it got a reputation as a hot ship. This notoriety, plus its ground-han-dling characteristics, didn't help sales. You might also note that the A17F and A17FS had modest little Wright Cyclone engines of 690 and 710 hp, respectively. They went 250 mph, though faster than many military ships, and in the air were said to be just as sweet as all models of the Staggerwing were. The A17F, incidentally, was owned at one time by a well-known pilot named Howard Hughes. 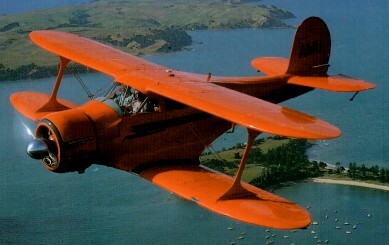 Meanwhile, Waiter Beech reversed direction, and designed a light-weight, low-powered Staggerwing - the B model. The first production model, built from 1934 to 1936, was the B17 powered by a 285-hp Jacobs (B17B), a 285-hp Wright R-760 Whirlwind (B17E), a 225-hp Jacobs R-755 L-4 (B17L) or a 420-hp Wright (B17R). Wingspan was reduced to 32 feet and electrically operated flaps replaced the split rudder for landing drag, but the biggest change was to the undercarriage; a wider, shorter and which now retracted, again by electrical means but with hand-crank backup, folding inwards to house the wheels under the forward fuselage. This machine was much more accurately tuned to the market in those still-depressed times, and Beech at last began to sell Staggerwings: 18 in 1934 and twice that in 1935 when business began to pick up, as it did for everyone. The Staggerwing had finally achieved commercial success. Structurally, the Staggerwing uses a mixture of materials and methods. The fuselage has a basic framework of welded steel tube over which is a web of wooden formers and stringers to shape the fabric covering. The wings are all wood: wood spars, wood truss ribs, and, again, fabric skin. The landing gear em-ploys big metal springs instead of oleos, and is electrically operated. The structure proved strong, except for an era of flutter failures of the top wing, which Beech cured by aileron balancing and plywood stiffening for the wing tips. The C-model Staggerwing gained a shorter landing gear and had the flaps on the lower wing to improve ground handling which was still a little hairy. Walter Beech never lost an opportunity to market his airplane. Staggerwings were regularly seen at air shows and did well in racing. The 1936 Bendix cross-country race was won by Louise Thaden and copilot Blanche Noyes in a C17R. Introduced in 1936 (to 1937), more than 60 C17 were made, but the following year the D17 brought in a number of changes. The most obvious was a rear fuselage extension of 18 inches, while the windscreen profile was altered and the tailplane made a cantilever unit. By now the peripatetic flaps had migrated to their final place on the bottom wing and the ailerons, of similar shape and length, were on the top, while the wings had a new NACA 23012 section and plywood covering outboard of the I-struts. Toe brakes replaced the unloved Johnson bar. The most popular model was the D17S introduced in 1937, with a 420-hp Pratt & Whitney R-985 Wasp Junior nine-cylinder, air-cooled radial engine, built from 1937 to 1945. Wartime production of USAAF UC-43 Traveller (based on the D-17S) and USN GB-1s and GB-2s amounted to 412. 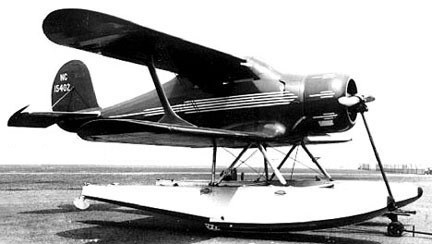 When in 1939 the US Army Air Corps needed a small communications aircraft, the excellent performance of the Model 17 resulted in the procurement of three Model D17s for evaluation under the designation YC-43. However, it was not until expansion of the USAAF began during 1941-2 that an initial production order for 27 was received, this leading to a total procurement of 207 Beech 17s under the designation UC-43, these being powered by the 336kW Pratt & Whitney R-985-AN-1 engine. After the United States became involved in World War II, an additional 118 civil Model 17s were impressed for military service, and comprising D17R, D17S, F17D, E17B, C17R, D17A, C17B, B17R, C17L, and D17W variants under the respective designations of UC-43A, UC-43B, UC-43C, UC-43D, UC-43E, UC-43F, UC-43G, UC-43H, UC-43J and UC-43K. The US Navy had acquired a single example of the Staggerwing as early as 1939. This was a 1937 civil C17R which became designated JB-1 . The designation GB-1 applied to 10 more, equivalent to the civil D17, acquired in 1939 and, later, to eight civil D17s impressed for military service, plus 63 from USAAF inventory [1589/1595, 1897]. Wartime procurement totalled 342 GB-2s (first flying in 1941), of which 105 were supplied to the UK under Lend-Lease, used primarily by the Royal Navywhich named them Traveller, a name adopted also by the US Navy, and the RAF. Some went to Brazil. The E17, built from 1937 to 1944, and the F17, built for the military from 1938 to 1944, were cheaper versions powered by Jacobs with strut-braced tailplane. A 1940 price list shows that an E17B went for $12,380, while the higher -powered D17S listed at $18,870. The last in the series was the G17 built from 1946 to 1948. The postwar model was the G17S. Based on the D17S with Pratt & Whitney R-985 Wasp Junior, it was fitted with enclosed gear fair-ings, cowl flaps, a longer windshield, larger vertical fin, and the engine was moved forward 12 inches with a longer, low-drag engine cowl and more modern disc brakes. At 9700 feet, pull-ing 65 per cent power, the G17 exceeds 200 mph. Most of the time it cruises at 53 per cent power and 185 mph, burning around 22 gph, with its 450-hp radial. Six fuel tanks (one in each wing, one forward fuselage tank, and one rear fuselage tank) carry 170 gallons to yield a seven-hour endurance or 1300-mile range. Approximately 20 G17 models were built and sold new for $29,000. Its labour-intensive production methods worked against it, especially when Beechcraft introduced its Model 35 Bonanza at only $8,000. Only 20 of the final model were made in 1946, but were not assembled and sold until orders were received over the next two years. The last G17S, serial number B20, assembled from parts in Texas, flew in 1949. In all, a total of 781 Staggerwings were built, of which 353 were commercial and 105 to USAF and 320 to USN, excluding 20 built in Japan as C17E. Normal useful load: 1130 lb. Engine: Wright R-975 Whirlwind, 420 hp. Engine: Wright R-1820-F11 Cyclone, 690 hp. Engine: Wright SR-1820-F3 Cyclone, 710 hp. Engine: Jacobs R-755 L-4, 225-hp. Cruise: 130 kt / 150 mph. Engine: Wright R-975-E3 Whirlwind, 420-hp. Length: 25 ft 11.5 in. Max cruise (65% @ 9,700ft. ): 175 kts. Normal cruise (53% @ 9,500 ft.): 161 kts. Fuel consumption @ normal cruise: 22 USG/hr. Range @ normal cruise, no res: 1,242 nm.